Walk across the ground of an empty lot. It can seem solid. And that may be so, for the weight of a human. It’s a different story for heavy equipment and certainly a building. The weight of a building has a different impact on the ground beneath it than you do, and that’s what excavation is really all about. It’s preparing the ground to support what will be built on it, which is far more detailed and precise than most people might imagine. Trees and rocks, or even existing structures, are the first things that must be safely and appropriately removed to prepare for building construction. While this is part of excavation, it’s only the start. Land clearing doesn’t mean a building site is reduced to nothing but bare earth. Excavators can be tasked with preserving certain trees or geological elements like natural hills. Proper land clearing ensures that the trees and vegetation that remain stay healthy. Generally, land clearing involves the removal of what’s above the surface and some of the topsoil itself. It’s called earth excavation when it’s necessary to dig foundation holes for buildings, bridges, or even roads, where the earth below the topsoil is also removed. Excavation can also include removing sediment and debris from water. The objective of excavation is to prepare the earth to support the building being constructed on it. This can mean moving and adding material, as types of soil can behave differently when they are compacted. It’s the excavator’s responsibility to work with construction architects to ensure that the soil offers a dependable surface to support the building. The Occupational Safety and Health Administration (OSHA) puts soils into four categories, which are sorted by stability. Stability is the main concern because a cubic yard of soil can weigh more than 3,000 pounds. It’s why excavation is also a science. It takes calculated and precise movements to position soil on a site to correctly support the project. It’s also why civil engineers and geological inspections are attached to the excavation process involved with commercial construction. The right type of excavation is also crucial for the creation of proper drainage on a piece of land, especially if the topography has been changed to accommodate the building. Often, this involves working with excavators to decide the way to create the smallest amount of impact to the existing parcel. Sites for new buildings, especially in urban areas, may need to be rehabilitated if preparatory testing discovers that the soil was contaminated by previous usage. This process is undertaken by excavating companies that collect the contaminated soil for relocation. These excavation site workers do more than remove the soil, they also work to monitor dust control. We think of excavation as digging into the ground, specifically as a space prepared for the foundation of a building. But when the excavation’s depth exceeds its width, it’s called a trench. Trench excavation is necessary for the placement of building-related functions like water pipe connections and sewage. These excavations can’t be more than 15 feet wide. OSHA calls excavations associated with trenching the most hazardous in the industry, and the agency requires excavations deeper than five feet to have protective systems in place. If the trench is deeper than 20 feet, the protective system must be overseen by a professional engineer. Preparing a site for construction involves more than clearing the land. It includes the cooperation of a group of professionals whom are experts in various fields ranging from engineering to geology. The soil on the site must be made “competent,” or strong enough to withstand the forces that the load of the building will put on it. Excavators are also responsible for the integrity of their work, as well as the consequences on the surrounding areas. Learn more about our commercial excavation services. 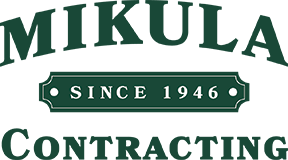 © 2014-2019 Mikula Contracting, Inc. All rights reserved.